LE MARCHAND DE LIGNERY, FRANÇOIS-MARIE, officer in the colonial regular troops; b. 24 Aug. 1703 in Montreal, son of Constant Le Marchand* de Lignery and Anne Robutel de La Noue; d. 28 July 1759. Lignery joined the colonial regular troops at the age of 14 as a cadet, but did not see active service until 1728 when he participated as aide-de-camp in a campaign led by his father against the Fox Indians. 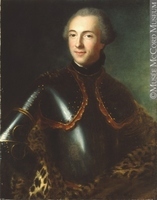 He was promoted second ensign in 1733, and during the winter of 1734–35 accompanied Nicolas-Joseph de Noyelles de Fleurimont in another campaign against the Foxes. In 1739 Lignery served as major of Charles Le Moyne de Longueuil’s detachment against the Chickasaws. Longueuil’s subsequent recommendation of Lignery led to his promotion to ensign on 17 May 1741. 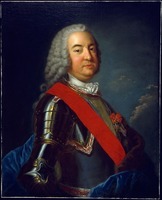 Later that year Lignery was appointed assistant town major of Montreal, and in 1744 received a commission as lieutenant. Lignery’s foe changed from Indian to English in 1744 with the spread of the War of the Austrian Succession to North America. 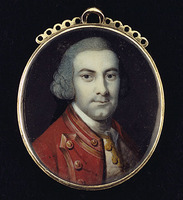 In April 1745 he acted as major and second in command under Paul Marin de La Malgue in an attack on Annapolis Royal, Nova Scotia. Lignery served in two further campaigns in Acadia – a 22-day blockade of Annapolis in October 1746 under Jean-Baptiste-Nicolas-Roch de Ramezay*, and a raid led by Nicolas-Antoine Coulon de Villiers on an English detachment at Grand Pré four months later. 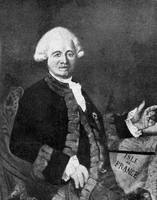 On 1 April 1751, with a total of 12 separate campaigns to his credit and a glowing recommendation from Governor La Jonquière [Taffanel], Lignery was promoted captain. He now returned to the west, where on 9 July 1755 he played an important role with Jean-Daniel Dumas* in the defeat of General Edward Braddock’s army in the battle of Monongahela; he was awarded the cross of Saint-Louis. Eight months later he was appointed commander on the Ohio, in succession to Dumas, with orders to maintain the loyalty of the western tribes and to harass the English with frequent war parties. 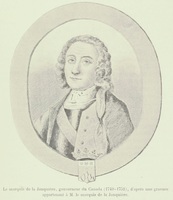 During the next two years, from his base at Fort Duquesne (Pittsburgh, Pa.), Lignery sent several raiding parties into Virginia and Pennsylvania. The raids were so successful that they greatly affected Anglo-American morale. In March 1758 General John Forbes was given command of operations to be carried out against Fort Duquesne, and proceeded towards it slowly, creating defended supply stations as he went. Lignery’s harassment of this expedition was effective. On 14 and 15 Sept. 1758 he easily defeated an advance party of 800 troops led by Major James Grant of the Scottish 77th regiment and continued the hit-and-run raiding tactics. Fort Frontenac (Kingston, Ont.) had fallen in August, however, food supplies were low, Indian allies were deserting, the season was late, and Forbes’ main army was increasing in size daily. In November a council of war agreed that Fort Duquesne should be abandoned. Lignery decided to send the bulk of his forces to Montreal, Detroit, and the Illinois country; he delayed the destruction of the fort until 23 November, when Forbes’ army was only 12 miles away, and then retired to Fort Machault at Venango (Franklin, Pa.) on the Ohio. From Fort Machault, where his force began to build up again in 1759, he continued sending parties on raids against the English. 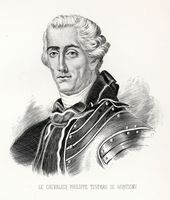 On 6 July however, Pierre Pouchot, the commandant of Fort Niagara (near Youngstown, N.Y.), was besieged by the English, and he appealed to Lignery for help. The latter abandoned his plans for a major attack on Fort Pitt, which the English had built to replace Fort Duquesne, and advanced to Niagara. On 24 July Lignery and his force of French and Indians were ambushed and he was captured. The fort fell on the 25th, and Lignery died of his wounds on the 28th. On 27 Jan. 1738 Lignery had married Marie-Thérèse, daughter of Daniel Migeon de La Gauchetière, in Montreal; seven children were born of this marriage, two of whom died young. The sons served as officers in the colonial regular troops; Lignery’s widow and two daughters retired to France with government pensions. AN, Col., E, 125; F3, 15, ff.225–30. Journal du chevalier de Lévis (Casgrain), 155, 161–64, 166. Journal du marquis de Montcalm (Casgrain), 110–11, 149–51, 192, 245, 462–63, 473–75, 493. Lettres de M. de Bourlamaque (Casgrain), 23, 26, 152, 193, 280–81. Lettres du chevalier de Lévis (Casgrain), 217–18. Lettres et pièces militaires (Casgrain), 153. “Une expédition canadienne à la Louisiane en 1739–1740,” APQ Rapport, 1922-23, 157, 181, 184–89. Fauteux, Les chevaliers de Saint-Louis, 161–62. Le Jeune, Dictionnaire. Frégault, La guerre de la conquête, 310–11, 332–33, 350–51. Gosselin, L’Église du Canada jusqu’à la conquête, III, 410–12, 491. Kellogg, French régime, 425–26, 434. McLennan, Louisbourg, 148–49. Stanley, New France, 99, 149, 186–91, 214–21. C. J. Russ, “LE MARCHAND DE LIGNERY, FRANÇOIS-MARIE,” in Dictionary of Canadian Biography, vol. 3, University of Toronto/Université Laval, 2003–, accessed April 24, 2019, http://www.biographi.ca/en/bio/le_marchand_de_lignery_francois_marie_3E.html.